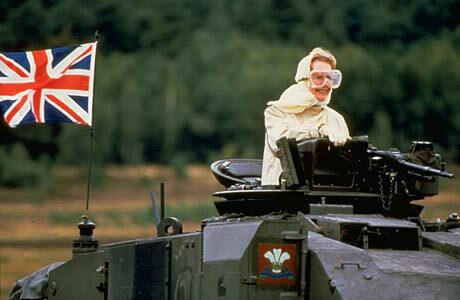 Theresa May arrives to lead her border troops into action in the battle of Calais. Comparisons with Margaret Thatcher are irresistible. But will her admiration for Geoffrey Boycott be career-limiting? The Home Secretary has avoided the rather blood-curdling descriptions of ‘swarms’ of migrants ‘breaking in’ to our country, as favoured by The Prime Minister. Today, [August 20th, 2015] however, she takes the initiative from Mr Cameron with a visit revealing details of a plan to deal with what the BBC calls The Calais Migrant crisis. The role of Home Secretary requires the holder to survive periods of public invisibility interspersed with possible career-threatening high profile decisions. The job also carries with it healthy aspirations to move into the top job. So, some statement such as “I have great pleasure in serving my country under our beloved leader than whom there is not nor has there ever been an equal for wisdom, integrity, and fragrance literally and metaphorically” may be taken to mean “you bet your bobbly bits I’m ready to take over, the moment I get the signal that the time is right to give the heave-ho to that spineless apology for a leader “. I am greatly indebted to the Daily Mail for illustrating a few months ago how well Theresa’s image-building as leader-in-waiting has gone. The Home Secretary wore flamboyant over-the-knee boots to greet Mexican President Enrique Pena Nieto and his wife Angélica Rivera. She teamed the risque patent leather boots with a bright red and gold coat and still managed to curtsy when greeting the Queen. While all might smack of foot-fetishism by the Mail and perhaps by Theresa May, The Guardian is not fooled. After hitting the Police Federation for six, the home secretary whose hero is Geoffrey Boycott is well placed for a leadership challenge. May has been heckled and booed by members of the federation, which represents 126,000 serving officers. But never before has an address of its kind been greeted by a stunned, near total silence. The police had to “face up to reality”, she told them, and if they didn’t reform themselves she would change the law to do it for them, imposing a series of drastic changes including cutting off all their public funding. Little wonder mouths were hanging open. To admirers, May’s speech was indicative of a boldness that is rarely seen as a handicap at the highest levels of politics. Within hours of her speech William Hill had made May its favourite to succeed David Cameron as the next Tory leader. Close observers describe her as a “Whitehall warrior” – working 18-hour days and insisting on seeing every piece of paper that goes through her office, taking even minor decisions usually left to civil servants . She has notched up some notable successes, in particular succeeding in the extradition of Abu Hamza to the US where a string of Labour home secretaries had failed. Theresa May as next Prime Minister? The odds only shifted slightly for me when I learned that she considers the cricket Geoffrey Boycott an admirable role model. Guess she has the political skill to explain that away before it becomes a career-threatening revelation. This entry was posted on Monday, August 24th, 2015 at 4:55 am and is filed under Uncategorized. You can follow any responses to this entry through the RSS 2.0 feed. You can leave a response, or trackback from your own site.